Let me start with; before deciding to get a ring-tailed lemur or any Primate for that matter, please check the laws in your state as well as the county you dwell in to be sure it is legal to have one where you live. I NEVER leave my primates alone ever. If I need to go somewhere without them, then my husband watches them and if something requires my husband and I to be there together, then we have a very close experienced friend that is family to us, babysit them for us. We bring them to her and pick them up when we are done doing what we had to do. And a baby, never leave them. I have cancelled important appointments when we first got Rocky, because he was in no way at a point as to me being able to leave him with anyone and hasn’t been fully ready now either, but we have done it twice recently and the first time he did call for me at first and then settled down, but he did do a Panic Poop. 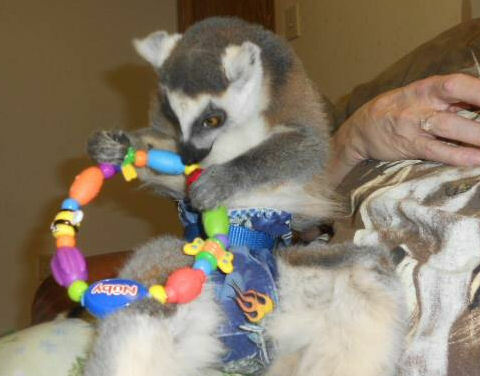 We got our first ring-tailed lemur Rocky 11 1/2 mos. ago, but before getting him, I learned a lot from a couple friends that have them and did a lot of research on them and amp-ted up my research and notes the closer I got to getting Rocky. Everyone kept telling me to get a male and not a female because the females are the dominate of the troop with lemurs. I already knew I wanted a boy anyways, however if my mind had of been set on a female, then a female is what I would have gotten. From all my many years of working with and training domestic and exotic animals, I already knew not to listen to that reasoning, for me, because I already know how to deal with those types of behaviors with dominant males and females. I am not a veterinarian, but I will try to explain the disease to you as our zoo vets did to me. Most captive lemur diets contain alot more iron than what a wild lemur would consume in it’s natural habitat. The iron leaves their blood circulation and is stored in their organs (particularly the liver), where it stays permanently. Here it can cause severe tissue damage, over time. There is no way to get rid of the iron that is “stored” in their tissues once it is there. 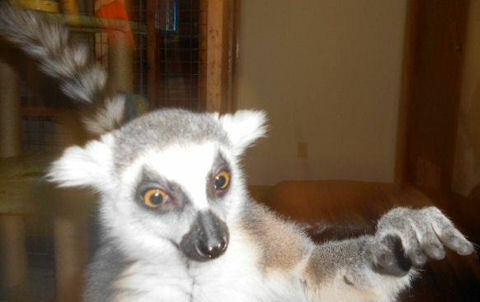 You are currently browsing the archives for the lemur category.